For the rugby union and rugby league footballer who played in the 1950s, and 1960s, see Hugh Duffy (rugby). Hugh Duffy (November 26, 1866 – October 19, 1954) was an American outfielder and manager in Major League Baseball. He was a player or player-manager for the Chicago White Stockings, Chicago Pirates, Boston Reds, Boston Beaneaters, Milwaukee Brewers and Philadelphia Phillies between 1888 and 1906. He had his best years with the Beaneaters, including the 1894 season, when he set the MLB single-season record for batting average (.440). He also managed the Chicago White Sox and Boston Red Sox and spent several seasons coaching in collegiate baseball and in the minor leagues. Later in life, he spent many years as a scout for the Red Sox. He was elected to the Baseball Hall of Fame in 1945. He worked for Boston until 1953. He died of heart problems the next year. Duffy was born in Cranston, Rhode Island to Irish immigrant Michael Duffy and wife Margaret Duffy. He was a textile mill worker who had taken up baseball as a semipro for weekend diversion. He played a couple years of minor league ball in the New England League before jumping to the majors, starting up in the league's initial season of 1886, and playing on clubs in Hartford, Springfield and Salem, as well as the Lowell, Massachusetts team in 1887. Duffy entered the National League with Cap Anson's Chicago White Stockings in 1888 after receiving an offer of $2,000 from the club. Anson initially was unimpressed with the 5 ft 7 in (1.70 m), 150 pound Duffy, telling him, "We already have a batboy." He shortly thereafter earned the reputation of an outstanding outfielder and powerful hitter. Duffy ended up replacing Billy Sunday as the team's regular right fielder. He switched leagues, joining the American Association's Boston Reds in 1891; he then returned to the NL with the Boston Beaneaters in 1892, where he enjoyed his best seasons. From 1891 through 1900, Duffy knocked in 100 runs or more eight times. 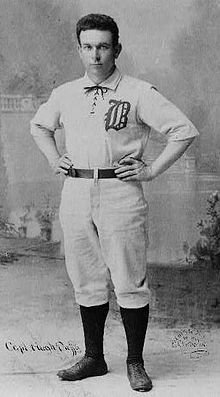 In 1894 Duffy had one of the greatest seasons in baseball history, leading the league with 18 home runs, with 145 RBI and a .440 batting average (see Major League Baseball Triple Crown). Duffy's .440 average is the major league single-season batting average record. At one point during the season, Duffy had a 26-game hitting streak. He was player-manager for the Milwaukee Brewers in 1901. During the 1902 and 1903 seasons, Duffy was player-manager for the Western League's Milwaukee franchise. Duffy was a player-manager for the Phillies from 1904 to 1906. He finished his career in 1906 with 106 home runs which was, at the time, one of the highest career totals. Duffy spent three years (1907–1909) as manager of the Providence Grays. He made $2,000 in his last season as the Providence manager and The Evening News in Providence wrote that Duffy was paid hundreds of dollars less than any other manager in the Eastern League. During Duffy's three seasons, Providence finished in third place, second place and third place, respectively. Duffy agreed to manage the Chicago White Sox in 1910. He stayed with the team in 1911. He moved to the Milwaukee Brewers of the American Association in 1912, but he was fired after a season in which the team struggled. He turned down an offer to manage the 1913 St. Paul Saints, saying that he was hoping to work in the east. He coached the Harvard varsity and freshman baseball squads from 1917 through 1919. He also managed the 1920 Toronto Maple Leafs of the International League to a .701 winning percentage — the best in the team's 83-year history, but only good enough for second place in the league. In 1921, Duffy was hired as full-time manager of the Red Sox, guiding them for two seasons. Duffy became a scout for the Boston Red Sox in 1924. Duffy remained on the scouting staff of the Red Sox nearly to the end of his life, retiring in 1953. He died in Boston on October 19, 1954. He had been suffering from heart problems. Duffy's wife Nora died the previous year; they did not have children. In 2019, Duffy was inducted into the Atlanta Braves Hall of Fame, along with Terry Pendleton. ^ Hubbard, Donald (2008). The Heavenly Twins of Boston Baseball: A Dual Biography of Hugh Duffy and Tommy McCarthy. McFarland. ISBN 9780786434558. ^ a b "Hugh Duffy left unequaled mark, was mighty mite". The Milwaukee Journal. October 20, 1954. Retrieved November 9, 2014. ^ a b "Hugh Duffy has signed to manage "White Sox"". The Evening News (Providence, Rhode Island). October 20, 1909. Retrieved November 23, 2014. ^ "Timely homer took heat off Felsch sale". Milwaukee Journal. February 6, 1949. Retrieved November 23, 2014. ^ Vaughan, Manning (November 13, 1912). "Hugh Duffy turns down St. Paul job". Milwaukee Sentinel. Retrieved November 23, 2014. ^ "Battery men at Harvard report". The Christian Science Monitor. February 14, 1919. ^ "Hugh Duffy dies". Eugene Register-Guard. October 20, 1954. Retrieved November 9, 2014. ^ "Baseball's Hugh Duffy dies at home at 87". Ocala Star-Banner. October 20, 1954. Retrieved November 9, 2014. ^ "Terry Pendleton, Hugh Duffy make Braves HOF". MLB.com. Retrieved 2019-01-18. Wikimedia Commons has media related to Hugh Duffy.